Every year my children have tried a different art program, and we've loved some of them and gave them rave reviews and some we just didn't mention because they were failures for us. See the Light has been so inspiring for myself and my children, and I knew we just had to share with you! 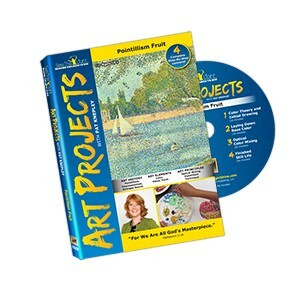 We had the option to choose from several DVD art classes and we chose Pointillism. We learned about the famous artist Georges Seurat and how he used small dots of paint from the very tip of his paintbrush and he added layer upon layer until he achieved the desired affect. 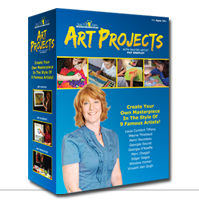 Here's a list of the different artists and art projects that are in the See The Light DVD series. Create Your Own Masterpiece In The Style Of 9 Famous Artists! You can purchase the whole set for $99.99 for more info click here or See the Light offers them separately for $14.99 each. Makenzie was intrigued and couldn't wait to start. We chose to use an orange, apple and banana for their fruit still life. First, she lightly sketched her fruit. Then she started adding color around the edges of the fruit with the tip of a Q-tip. 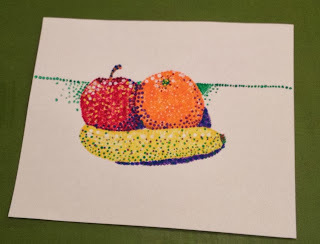 Next, she filled in each fruit with a solid color. During each segment of the video Pat Knepley is instructing on how to shape the fruit, shading, she goes over the color wheel, she shows examples of Georges Seurat's gorgeous paintings and she also opens up her Bible and reads scriptures that go along with what she's speaking about. Makenzie started working on her shading in this step. Finally, she finishes her painting by making sure it looks just like she wants it to with shadows, all the stems on and a table line added. I love the finished painting, Kenzie did a great job. Kylan did too but he asked me not to post his work so I'm honoring his wish. I hope he will let me post it sometime in the near future so you can see what he did too! Our next project will be creating a paper flower in the abstract style of Georgia O'Keeffe. A couple of things you might want to know before you get started are make sure you have all the supplies that are listed on the DVD. They make it easy for you! Set aside about an hour and a half or so to watch the DVD and work on each lesson.